By popular demand, THE SKY IS NOT THE LIMIT has been extended through Saturday, October 3, 2015. 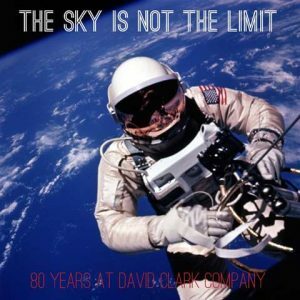 THE SKY IS NOT THE LIMIT exhibit in the Booth Gallery explores how David Clark transformed his company and reached new heights in protective self-contained environments for high altitude pilots and astronauts. Many never seen by the public products will be on display. This exhibit is supported in part by the Wyman-Gordon Foundation and the Worcester Arts Council.